5 Delicious Ways to Enjoy Brekkie in Bed! When the weather takes a turn for the chillier, and after a long week, there’s nothing better than snuggling down into bed and indulging in a delicious breakfast! Dr Jo, Nutritional Advisor for Freedom Foods, has got you covered with five delicious ideas, so you can say bye-bye to soggy toast and hello to something totally scrumptious, plus, will keep you feeling full and nourished all the way to lunch! The night before place ¼ cup Freedom Foods Porridge oats, a small handful of chopped mixed nuts, a pinch of ground cinnamon and a sprinkle of pepitas and chia seeds into a small bowl and pour over ¼ cup Australia’s Own almond milk. 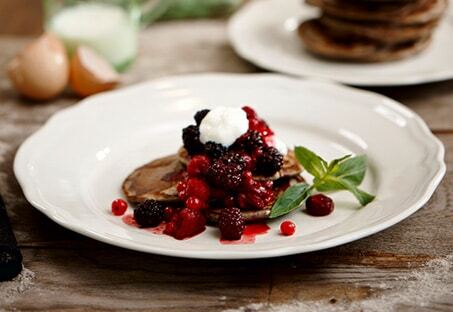 In the morning Serve topped with a dollop of Greek yoghurt, grated or sliced apple and fresh berries. For an extra treat drizzle with a touch of maple syrup. Cover and place in the fridge overnight. 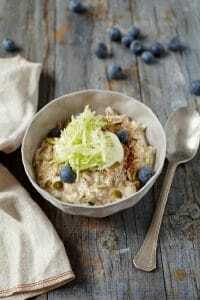 In the morning Serve topped with a dollop of Greek yoghurt, grated or sliced apple and fresh berries. For an extra treat drizzle with a touch of maple syrup. Blend a packet of frozen acai pulp with a ½ cup of frozen raspberries, the juice of an orange and ¼ cup Greek yoghurt. Pour into a bowl (it should be a nice thick consistency that you eat with a spoon) and sprinkle half the bowl with Crafted Blends Clusters (any flavour variety you like), then layer a row of fresh berries, sliced bananas or any other fruits, nuts and seeds. Heat a cup of milk (or almond milk for a dairy free alternative) with a cinnamon stick in a small saucepan. Wash ¼ cup of Freedom Foods quinoa in a sieve under running water – do this until any soapy looking bubbles disappear. Add the washed quinoa to the pan and bring to a simmer. Cover with a lid and cook for about 30 minutes or until all the liquid is absorbed. Turn off the heat, leaving the lid on. Meanwhile chop a stalk of rhubarb and ½ apple and stew in a small pan over moderate heat with a little amount of grated ginger, 1 tablespoon of freshly squeezed orange juice and a little honey or maple syrup. Toast a tablespoon of shredded coconut in a non-stick frying pan. 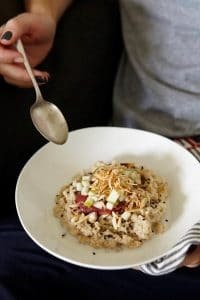 Serve the quinoa porridge topped with the stewed rhubarb and toasted coconut. 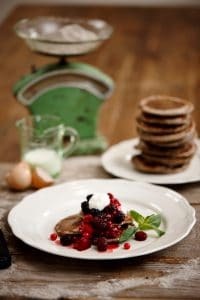 Whisk together a cup of buckwheat flour, ¼ cup brown rice flour and 11/2 teaspoons of baking powder with 1 cup buttermilk, 2 eggs and a teaspoon of vanilla paste. Add a little milk if the mixture is too thick. Allow to sit for 20 minutes and then heat a non-stick frying pan, drizzle with a touch of extra virgin olive oil and pour in ¼ cup of the pancake mixture. Tip the pan to spread the mixture into a thin even circle. Cook for a couple of minutes or until bubbles start to appear on the surface. Flip the pancake and cook for a couple of minutes on the other side. Keep warm while you cook the remaining pancakes. Serve topped with your choice of Greek yoghurt, fresh berries, sliced banana, toasted nuts or seeds. In a glass layer Greek yoghurt, fresh sliced strawberries, raspberries, kiwi fruit and Crafted Blends Muesli with Nuts. Repeat until the glass is full, finishing with the fresh berries on top. Perfect for eating in bed!